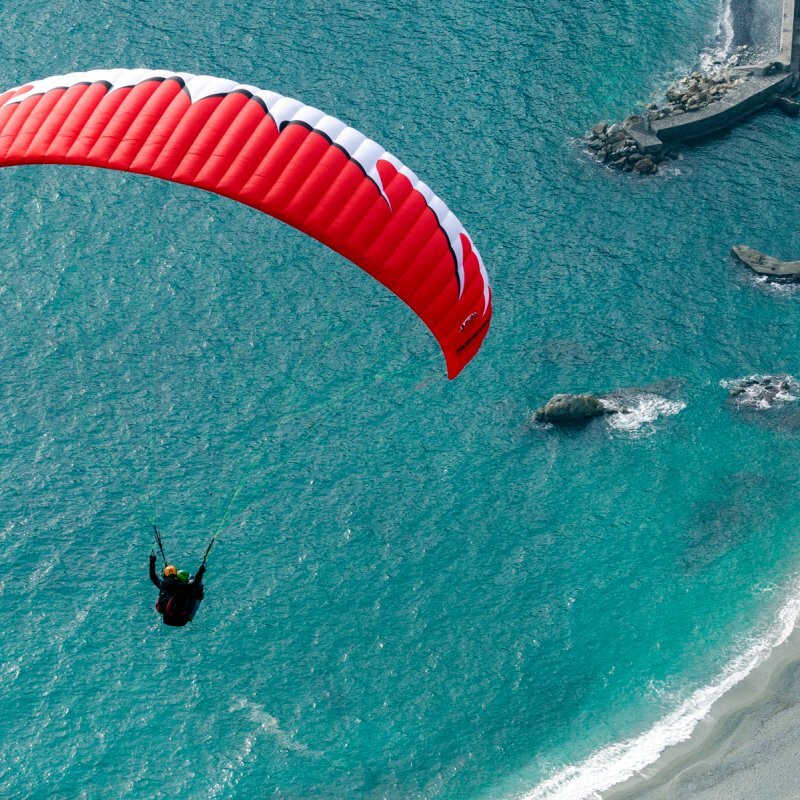 The PARAMOTION is the first paraglider which is adaptable to almost all circumstances. This flexibility is possible through the built- in zipper with which the surface of the PARAMOTION can be reduced by 2 cells. Therefore the operating range of the quick-change artist is infinite. As numerous as its possible applications, as wide are its certifications. 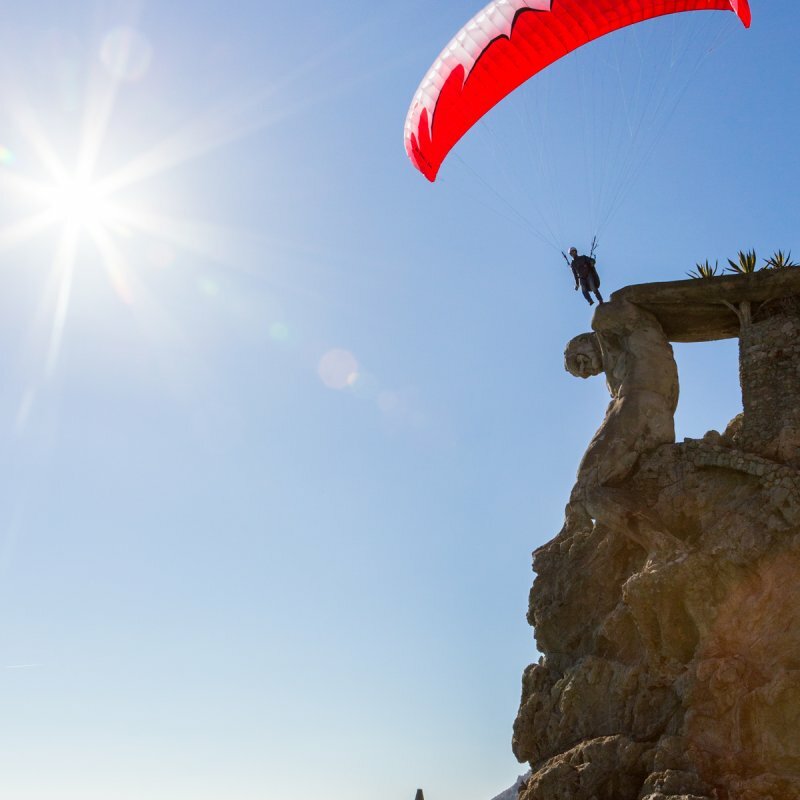 Besides the normal LTF/EN-B certifications, respectively LTF/EN-A wihout trimmer, the PARAMOTION also possesses a paramotor certification and even a tandem certification. Thereby the operating range is really infinite. The very large weight range is also making the PARAMOTION interesting for the use with a single trike. The flexible glider size is not only a big advantage for the miscellaneous operating areas, but also enables the adaption of the weight range to the given weather conditions. This way you can for example reduce the surface of the glider in rough and windy conditions through the zipper while in calm conditions the whole surface will be used. The PARAMOTION is equipped with 42 cells and a flat AR of 5,06. The surface of the PARAMOTION can be reduced by the zipper from 35,5 to 33,1 square meters, and these 2 cells can be folded and stowed away in the inside of the glider. In the air the PARAMOTION behaves incomplex and mistake forgiving, however it reactes directely to the control pulses. The canopy is gliding exceptionally well also in the accelerated mode and in thermal the glider operates efficiently and makes good height. Through the versatile areas of use and the high flexibility of the glider, special value was put onto the durability. This is why only high-quality components are built in and the suspension points are additionally strengthened. That guarantees sustaining good flying features - and long-lasting joy. certified as paramotor as well as it is as tandem glider. 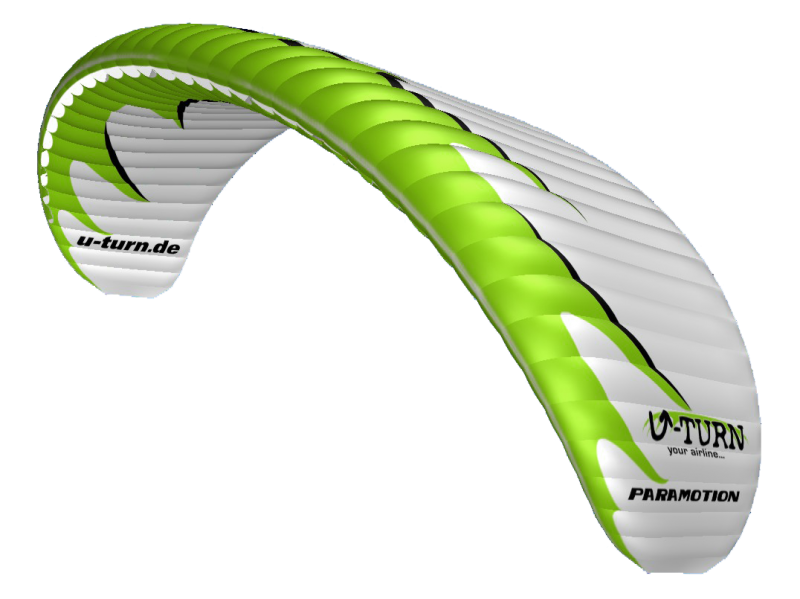 The Paramotion is available as of now in size 35,5/33,1 with LTF/EN-B and LTF/EN-A (without trimmer) motor- and tandem certification in 2 appealing color combinations. 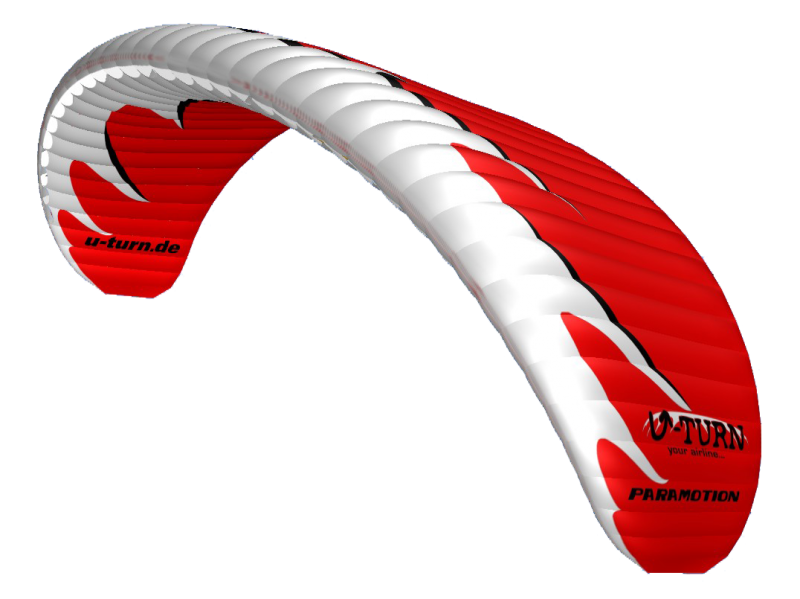 The PARAMOTION is an allrounder and is aimed at pilots who are looking for a glider with extremely high weight range. 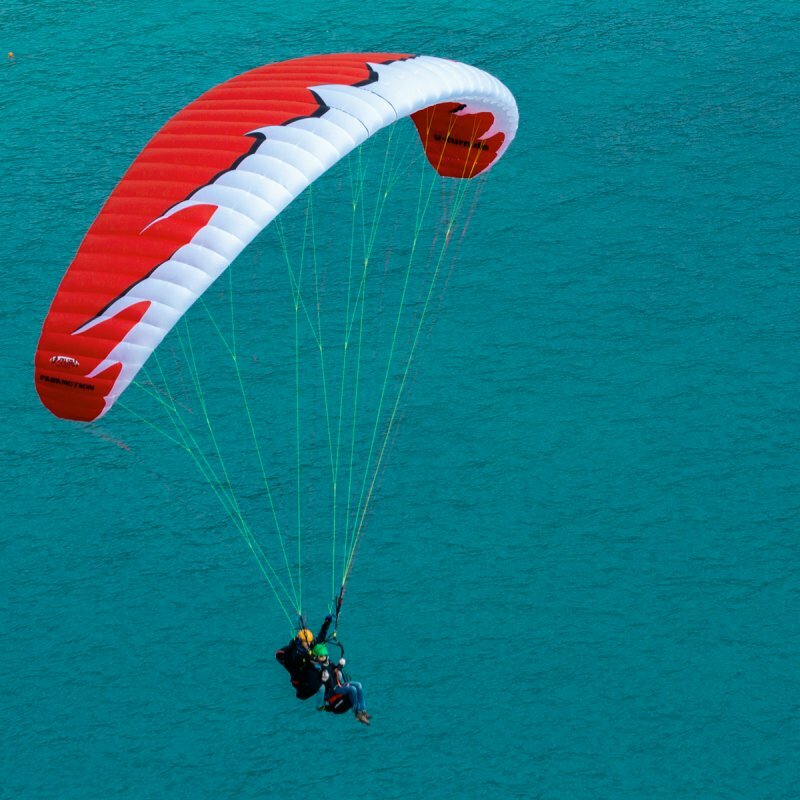 The PARAMOTION is suitable for beginners and is covering a weight range from 100 up to 160 kg and is certified as paramotor as well as it is as tandem glider. Base of the multifunctional glider is the established EMOTION. This is clearly noticeable in it‘s very sweet tempered and mistake forgiving features, because the PARAMOTION is also equipped with the Automatic Flight Stabilisation (AFS). This innovative system by U-Turn intervenes if the air gets turbulent. This technique is possible through a precise calculation of the pre-tensioning at the end of the wing. Whilst the sail is gliding through smooth air, the internal pressure of the wing keeps the trailing edge neutral, but if the pressure on the inside of the wing sinks, the system is correcting immediately. The glider is being slightly braked automatically through the pre-tensioning. B-flight. Through equal soft pulling the glider is going into the B-flight without tipping over and even reaches up to 5 m/s. With according release of the outer B-loops it is steerable during that.